CMS Form 1500 or formerly called HCFA Form 1500 is the standard insurance form used to bill Medicare Part B and other insurance carrier professional claims. There are several common reasons why paper claims get rejected. This article will help you with the most obvious ones. If your medical billing software is working correctly and you are using a HIPAA compliant version, the problem is of the most common variety.... human error. Take a look at an example of the new CMS-1500 02/12 claim form. What are the changes? The biggest change is Box 21, the diagnosis box. The field has space for 12 codes and the diagnosis code pointers are now identified by letters A-L rather than numbers 1-4. 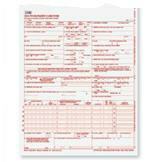 To order CMS 1500 forms and envelopes at a great price go to: http://www.health-forms.com. Their customer service is excellent! This article is not intended to tell you how to bill, but rather, to point out the most common reasons for HCFA rejections. (By the way, CMS 1500 is the correct and current form name. I use the term HCFA out of habit). Generally, commercial insurance carriers are more forgiving of errors on paper claims than Medicare and other government claims. Medicare requires that you dot every "i" and cross every "t". Also, their rules are different so I have listed them separately. Please note that some of the errors mentioned below may never cause you a problem, but the point is, don't give an insurance company any excuse to reject your claim. A picture is worth a thousand words. Download and print the sample hcfa forms provided and follow along. I've included a Medicare claim and a commercial non-Medicare claim. Be sure your forms are lined up properly and all data is in the correct boxes. Many carriers scan their claims and truncated data will cause claims to reject. Box 12 - Enter the patient name or the words "Signature on File" in this field. This authorizes release of medical information and payment of government claims if assignment has been accepted in Box 27. Box 13 - Enter the policyholder name or the words "Signature on File" in this field. This authorizes release of payment to the supplier of services indicated in Box 33. Please note that certain carriers will override this field and only pay the policyholder in the event that the provider is not contracted with the carrier. Box 17 and 17b - In some instances, the referring provider name and NPI are required. No other pins or IDs should appear in Box 17a. Box 24j - Enter the NPI of the rendering provider who performed the service. The NPI should appear on the bottom portion of Box 24j. No other pin or ID should appear in this field. Box 25 - Enter the tax ID of the billing provider and indicate whether the ID is a social security number or EIN (Employer Identification Number). Box 32 - If the place of service in Box 24b is not the office or the patient's home, enter the name, address, and NPI where the service was provided. Box 33 - Enter the name, address, and NPI (in Box 33a) of the billing provider. No other pins should appear in this field. Box 7 - Leave blank. Box 11 - Enter the word NONE. Box 11a through 11d - Leave blank. Box 24e - You may enter 4 diagnoses in Box 21, however, only one diagnosis code pointer should appear in this field. It can be a 1, 2, 3, or 4. Box 27 - Check the box yes or no to accept assignment. Box 32 - Always enter the name, address, and NPI where the service was provided. The following examples demonstrate how to set up your claims in different billing scenarios. Example #1 Dr. A is a solo practitioner who is not incorporated. His NPI is entered in Box 24j and Box 33. His social security number is entered in Box 25 and checked as a type SSN. Example #2 Dr. A is a solo provider who's practice is incorporated. Dr. A's NPI is entered in Box 24j. The "group" or corporate NPI is entered appear in Box 33. The corporate EIN is entered in Box 25 and checked as a type EIN. Example #3 Dr. A's practice is incorporated. Dr B. works for him. A claim for Dr. B will look as follows: Dr. B's NPI will be enter in Box 24j. Dr. A's practice name, billing address, and "group" NPI are entered in Box 33. The corporate EIN is entered in Box 25 and checked as a type EIN. You'll never avoid all paper claim rejections, but this information should help you avoid the most common HCFA rejections. If you are a Medisoft user and need help with setting up your paper claims properly, please visit our Medisoft Training page.